03 Aug 2008 - Osceola Velo Club's Pat Schlager and Jose Cortes were on hand for the 4th race of the 2008 Team Armada Training Criterium Series in eastern Orlando, FL. As has been the recent trend in the B-race, a couple of riders established an early breakaway with a couple more getting off the front later on but unable to bridge the gap. Team Armada, who had a rider off the front, kept the reduced peloton in check to prevent any organized chase efforts. Jose C. rode strongly in the main pack and made his move with 2/3 of a lap to go. Jose was able to hold off the others to win the "best of the rest" sprint for 5th place in the race thus scoring a point in the Training Crit Series. Great racing, Jose! Check out the photos. 27 Jul 2008 - Osceola Velo Club's Dave Zak joined Pat Schlager for the 3rd race of the 2008 Team Armada Training Criterium Series. The B-race started at an uncharacteristic blistering pace which shelled off a couple of racers by the 5-minute mark, including Pat S. On the other hand, Dave Z. was able to hang on to the main field for the entire race. A three-rider breakaway established itself by the race's mid point and stayed away until the end. Dave Z. did a great job riding in the reduced peloton and finished in tenth place while Pat S. crossed the line as Lanterne Rouge. Way to go, Dave! 20 Jul 2008 - Osceola Velo Club's Pat Schlager lined up for the 2nd race of the 2008 Team Armada Training Criterium Series which was moved to Sunday mornings due to the very high probability of rain on its original Tuesday evening dates. A Colavita rider jumped away at the sound of the gun in the B-race, but the main pack wisely let him go, knowing that he wouldn't last out there on his own. The quick pace of the peloton prevented anyone bridging up to the rogue racer and he was soon back in the folds of the main field. However, the peloton's high pace did seperate a number of riders off of the back with only eight riders still together by the race's mid point, and yes, Pat S. was still there. Things picked up, as they always do, with a couple of laps to go, but by then Pat was too tired to contest the finale and cruised on home for another top-10 finish. The Osceola Velo Club welcomes its newest members Dan Stephens and Richard Game. 04 Jul 2008 - Osceola Velo Club's Pat Schlager represented the club at the 4th of July Criterium to benifit local members of the Florida Velo Development Team who are on their way to a stage race in Canada. 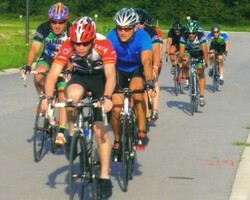 The criterium was held in eastern Orlando along the roadways of an unfinished housing development. Surprisingly, this was Pat's first crit of the 2008 season. Pat rode strongly at/near the back of the B-race peloton using his experience and skills to save energy. Multiple breakaway attempts were made but none stuck or really roused the main pack until a Team Armada rider launched a vicious attack with two laps to go. Pat was ready for this one but just did not have the legs to make a go of it and ended up cruising home in the splintered main group for a top-10 finish. 21 May 2008 - Osceola Velo Club's Pat Schlager and Dave Zak were at it once again at the 3rd race of the 2008 Lake Louisa Cycling Series. But instead of just "sitting in" this time, Pat S. launched a totally unexpected (to the peloton, teammate Dave Z. & even to Pat S. himself) attack off of the front of the main field after the first turnaround, uphill, and into the wind, even. Dave did a great job of blocking, allowing Pat to obtain a good 100 meter gap off of the front. Of course, the rolling terrain and strong, gusty winds put an end to Pat's attack, but Pat was able to latch onto the back of the speeding peloton and hung on for nearly another lap. Dave also dropped off the back of the main field and the two teammates worked together to finish the 4 1/2 lap B-race with Pat crossing the line as Lanterne Rouge. Nice. 14 May 2008 - Osceola Velo Club's Pat Schlager and Dave Zak took part in the 2nd race of the 2008 Lake Louisa Cycling Series on 13 May 2008. Pat S. set the pace during the neutral rollout then settled into the peloton for the opening lap of the 4 1/2 lap B-race. The very windy conditions and good team tactics by the Citrus Cycling Team whittled down the main field early on with both Pat S. and Dave Z. finding themselves in small groups off of the back just trying to survive until the end of the race. 16 Apr 2008 - Osceola Velo Club's Pat Schlager and Jose Cortes lined up for the opening race in the 2008 Lake Louisa Cycling Series held in the Lake Louisa State Park just south of Clermont, FL on 15 Apr 2008. The weather was unseasonally chilly and very windy, which just added to the difficulty of the rolling terrain in the park. Pat S. kept Jose C. near the front of the peloton on the opening lap of the 20-mile B-race then dropped off leaving Jose safely in the main field. A six-rider group managed to get off the front early in the race and stayed away until the end. Unfortunately, Jose did not make the break but was able to remain in the main pack to contest the uphill sprint for "best of the rest" for a top-15 finish. 25 Feb 2008 - Osceola Velo Club's Dave Zak (Cat 4) and Jose Cortes (Cat 5) raced at the Lake Mary Criterium held in Lake Mary, FL on 24 Feb 2008. Coach Pat S. was also on hand to take photos. Jose C. rode strongly in the Cat 5 main pack until the first prime. After that, he continued with a small group just off the back for the remainder of the race. Good racing, team. Check out all of the photos. 02 Feb 2008 - The Osceola Velo Club's Dave Zak and Pat Schlager each scored a Florida Points Series (FPS) point in their respective racing catergories at the SCVS Winter Time Trial held near Deer Park, FL on 02 Feb 2008. This was Dave Z. 's first race as a newly upgraded Cat 4. 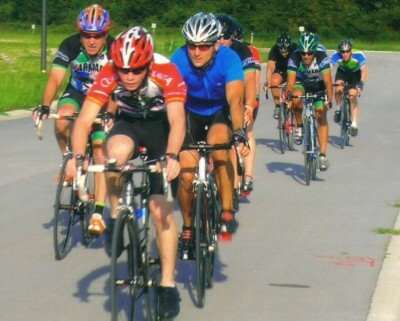 Also on hand was Osceola Velo Club's Jose Cortes who placed 5th in his first race as a Cat 5. (Men's Cat 5 are not part of the season long FPS; therefore, no FPS points were available for Jose C.) Great start to the 2008 season, team! Dave Z. riding strongly in the peloton. 05 Jan 2008 - The Osceola Velo Club is now in its pre-season training phase with racing members working on increasing their VO2max and Lactate Threshold in order to bring them up to speed for the approaching 2008 Florida Points Series scheduled to begin on 09 Feb in Gainesville, FL. Also say "Hi" to the Osceola Velo Club's newest racing member Jose Cortes. Jose will be racing in the Men's Cat 5 this season. 03 Nov 2007 - The racing members of the Osceola Velo Club have begun their off-season training for the upcoming 2008 Florida road racing season. Their training program for the early off-season consists of building aerobic endurance on the road with long steady distance (LSD) rides as well as general strength training in the gym. 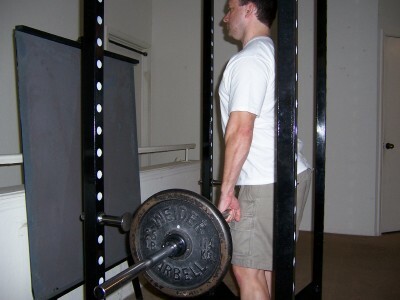 Osceola Velo Club's Licensed Cycling Coach and Certified Strength & Conditioning Specialist Pat S. is a firm believer in the modern training adage of "bigger, stronger, faster." Pat S. in the gym preparing for the 2008 season.